The Pulitzer Prize for Fiction is something I look forward to every year. Since there are no nominations announced in advance, I dizzy myself with speculation: Will the committee go with a crowd-pleaser, or go delightfully obscure? A book that takes place on American soil or in another country? The possibilities are endless. I usually get it wrong, but I don't mind. A new book will soon be nestled on my Pulitzer Fiction shelf. It's 1917. 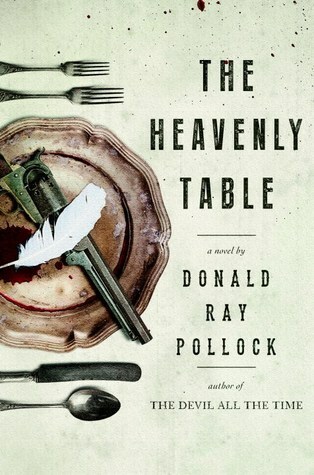 After their hapless father dies, or goes to "the heavenly table" as he terms it, three brothers, Cane, Cob, and Chimney Jewett decide to ditch their downtrodden life and try their luck as bank robbers. They've been inspired by a beat-up dime novel called The Life and Times of Bloody Bill Bucket and although they know it by heart, they still refer to it while they're on the lam. This is the starting point for their encounters with what seems like hundreds of other characters, including Ellsworth and Eula Fiddler, who have a son, Eddie, who may or may not have joined the Army to fight in the Great War...in Germany? Where's Germany? What's this war supposed to be about? I finished this novel in early March, and I'm already ready for a re-read. Maybe audio this time. Read/Listen with me so we can talk about it. A LOT. Did I mention how cinematic The Heavenly Table feels? I don't know if it could work on the big screen because there are so many characters, but if it does become a movie, I am there. I will even pay full price and forget to stand just so under the light in the ticket line so that my gray hair is shown to best advantage. Maybe a miniseries? That would work for me. So that's my Pulitzer Fiction Wishful Prediction. I think my chances are pretty good this year. We'll know on Monday. Many thanks to my friend Mary for bringing not only The Heavenly Table but Donald Ray Pollock to my attention. Oh my goodness... you had me at Sisters Brothers.